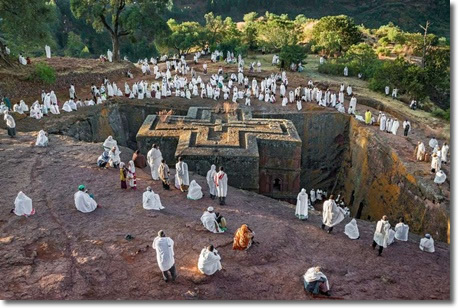 The prominent rock-hewn churches of Lalibela are eleven in number and situated in three groups separated by the seasonal river Jordan churches of the first group are believed to have been built first and are usually visited first by many of the tourists. They are BeteMedhane-Alem, Bete Mariam, BeteMeskel, BeteDenagel, BeteAmanuel, BeteMerkorios and Bte Abba Libanos. In the third group, there is only one isolated church. i.eBeteGiorgis. It is located a few minutes walk to the south west of both the first and second group of churches. In addition to the abovementioned churches, there are also other rock-hewn structures in Lalibela. The Tomb of adam (Qeranio) and Bethlehem are good examples in this regard. The former one is a cross like huge block of stone that stands in craved deep trench in front of the western face of Bete Golgotha. The latter one is a cone shaped shrine located at the center of the second group of churches. King Lalibela is credited with the foundation of the 11 rock-hewn churches in the 12th century. One of the world’s most incredible man-made creations, they are a lasting monument to man’s faith in God. Most travel writers describe these churches as the “eighth wonder of the world”. These remarkable edifices were carved out of a solid rock, in a region where the ragged landscape still protects the churches from mass tourism. The 11 man-made churches are found in and around the town of Lalibela. Other churches are reached by a 45-minutes’ drive by 4×4 vehicle, or a three-hour ride on mule-back. The venue for some of the most famous church festivals in Ethiopia, a visit during the great celebrations of Genna (X-mas) and Timket (Epiphany) is particularly rewarding.